Summary: I found Paulie Litt as Spritle, Speed’s younger brother, intensely annoying, the small boy in the row behind me at the screening was in hysterics every time he and his chimp companion appeared on screen, so what do I know? 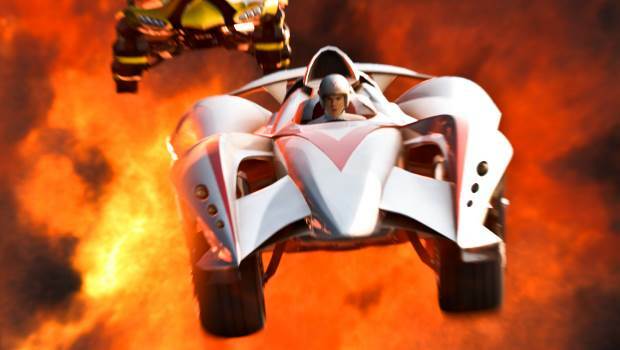 Speed Racer is, genuinely, like nothing you’ve ever seen before. A kaleidoscope of colours, a riot of speed, where retro styled cars flip and spin and crash into each other, moving like snowboards or skateboards. Speed (Hirsch) is a hot shot racing driver, a natural behind the wheel. Born to race, he thinks of nothing else – he is aggressive, instinctive and fearless. Speed’s only real rival is the memory of his brother Rex, whom Speed idolised, and whose records Speed is determined not to break. Speed works for his family’s company, led by his father, Pop Racer (Goodman), the designer of Speed’s Mach 5. Speed comes to the attention of Royalton Industries, and their egomaniac owner (Allam), who makes Speed an offer he assumes Speed won’t refuse. When Speed turns it down, Royalton, furious, tells Speed a terrible secret; all the biggest races are fixed, and Speed will never win a race again. Speed refuses to believe it and, determined to beat Royalton at his own game, teams up with the mysterious Racer X (Fox) and Taejo Togokhan (Rain), to win the race that cost his brother his life – and his reputation. If Speed can win the death defying Crucible, he has a chance at the Grand Prix, racing’s ultimate prize – but between him and the checkered flag stands every other racer in the competition, determined to win the million dollar bounty that Royalton has placed on Speed’s head. With the Wachowski Brothers’ reputation resting on the success of Speed Racer, following the critically derided Matrix sequels, the good folks at Warner Brothers must be crossing their fingers, legs, toes and everything else and praying for a good opening weekend. They can relax; Speed Racer should do them proud. It’s silly and noisy and kinetic and a lot of fun; a perfect summer movie, styled like Desperate Housewives on acid. Thankfully the Wachowskis have given up Freshman Philosophy and replaced it with qa much more straightforward underdog story, concentrating on what they do best; creating fantastic, and yet believable, new worlds. The styling is retrofuturistic, like Futurama only brighter, with the interiors of the Racers’s home decked out in acid shades and Royalton Industries in purple from head to toe. The cartoonish quality extends to the actors, Ricci as Speed’s ever supportive girlfriend Trixie especially Thunderbirdish with her neat bob and perfect lipstick, piloting a bright pink helicopter in co-ordinating jumpsuit and gloves; Sarandon in gingham aprons and capri, cheering Speed on. The racing cars do everything but fly, hurtling round vertiginous speedways at improbable angles, flipping over each other and crashing into each other with seeming impunity. The acting comes second to the effects but Sarandon and Goodman inject some gravitas into the proceedings while Matthew Fox is serious as Racer X and Emile Hirsch has a blast as Speed, gasping post-orgasmically after every race. Roger Allam has most fun as cartoon villain Royalton, and while I found Paulie Litt as Spritle, Speed’s younger brother, intensely annoying, the small boy in the row behind me at the screening was in hysterics every time he and his chimp companion appeared on screen, so what do I know?